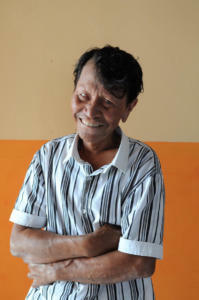 Netherlands Leprosy Relief (NLR, http://nlrindonesia.org, http://leprosyrelief.org) is a Dutch NGO founded in 1967, and has since developed into one of the leading organisations in the area of leprosy control. NLR combats leprosy via early detection, treatment and rehabilitation, and aims to remove the barriers that prevent people with disabilities from independent participation in society. Indonesia is the number 3 in the world if it comes to new leprosy cases. Over the last 10 years, the number of new cases has remained rather stable at around 16,000. Of concern is an increasing trend in leprosy in children, indicating that leprosy is not under control in Indonesia. NLR-Indonesia supports the Ministry of Health’s program on leprosy financially and technically (training health staff) in 20 provinces in Indonesia. Indonesia was also one of the countries who started to support self-care groups, and learnings were distributed and used in other countries. Early 2015, I was asked to document NLR-Indonesia’s activities ranging from advocacy to implementation of the programs, from field- and health centre visits to provided trainings, and from home visits to detect early leprosy to innovations boosting the effectiveness of leprosy control programmes. The major purpose was to create an awareness campaign in order to reduce stigma. Showing NLR’s activities should create more transparency and facilitate the way to a check-up. The portraits deliberately show people affected by leprosy in a ‘normal state’, a situation in which factually most ‘patients’ are, non threatening and stigma free!